One way to keep up with the news is through Twitter. 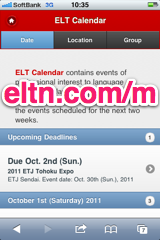 On this page, you'll find links and information about the Twitter accounts that belong to various organizations whose events are posted on ELT Calendar. ELT Calendar posts reminders (such as call for paper deadlines), updates to events (such as cancellations, changes in starting times, etc. ), and information about upcoming events.